Last Monday, some good friends from the book club and I have officially begun our buddy-read/read-along of Hilary Mantel's Man Booker-winning work, Wolf Hall, the first book in the Thomas Cromwell Trilogy. (The second book is Bring Up The Bodies.) 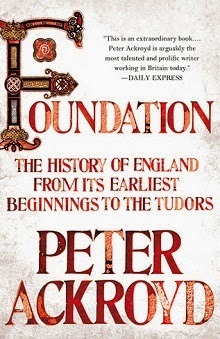 As I have said elsewhere, I've tried to read Wolf Hall twice already, and both attempts were sorry failures. So I figured that if I wanted to read and finish this book within the year, a reading buddy is what I need. I was so happy when these lovely friends expressed interest and are now on board. I've always tried my best to be a disciplined buddy-reader, so I devised a reading plan and schedule that isn't too hard for me and my "buddies" to follow: my trade paperback copy is around 600 pages excluding the Cast of Characters and Family Trees, so I thought we could try to read more or less 100 pages per week. The plan is manageable, but the result is that we'll have to extend reading it until February. Red flaglets for every 100 or so pages per week. 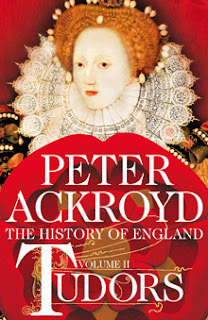 As a result of reading all about Tudor history, I became so intrigued, and because I know little about that part of English history, I bought two books by Peter Ackroyd that tackles the subject: Foundation (The History of England, #1) and Tudors (The History of England, #2). If I were to read any non-fiction books, let it be on this sub-genre: history. It has been a while since I've read up on history so I'm looking forward to reading these! My little girl, on the other hand, is also enjoying these Dr. Seuss books that we bought for her last New Year's day as a belated Christmas gift. This is a 12-book set from Fully Booked, containing Dr. Seuss's most popular works. Aren't they the prettiest things? We're both first-time Dr. Seuss readers! And I am happy to say that the reading plan is a big help for me. I am not pressured! And I realized, I haven't read to Ramsey, haha! weird. or (little) boys. huh.